Calandrinia grandiflora is a fleshy, tender perennial that can be grown in zone 7 as an annual. The fleshy leaves are gray-green up to 8 inches long and the plant will reach about 36 inches tall. Calandrinia is a native of Chile. Blooming Time: Summer. The purple flowers are 2 to 2½ inches across and last only one day. Culture: Calandrinia grandiflora needs a well-drained soil and full sun to partial shade. In the greenhouse we use a soil mix consisting of 2 parts sand to 1 part peat moss to 1 part loam. The plant should be allowed to dry in between waterings. Fertilize monthly with a balanced fertilizer diluted to ½ the strength recommended on the label. During winter rest period, water should be restricted to only enough to keep the foliage from shriveling. Propagation: Calandrinia grandiflora is propagated by cuttings or by seed. 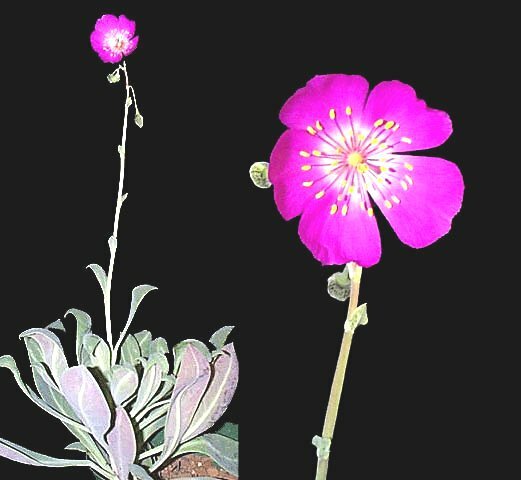 Calandrinia grandiflora was featured as Plant of the Week July 14-20, 2000.